Oh noes! 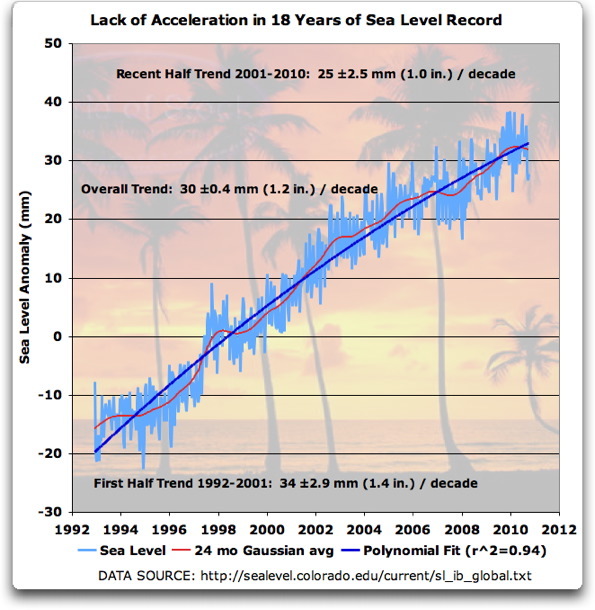 Sea level rising three times faster than expected (again) | Watts Up With That? UPDATE: The serial regurgitation has started. See the end of the article. Somehow, I just can’t get past the picture of the guy in the beret who seems to be saying to the cameraman “Look the island! It is disappearing before our eyes!”. Red underline mine. 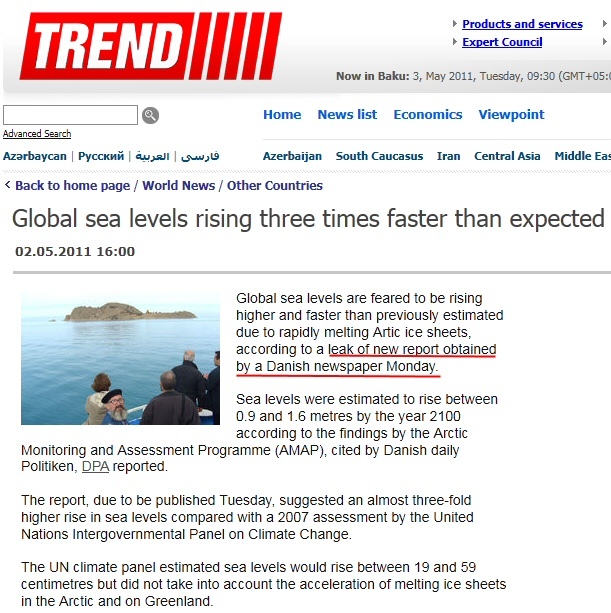 Yep, back in 2009, the same claims were made, right about the time of the Copenhagen Climate Conference. Of course it isn’t surprising to see Climate Progress leading the pack with such disinformation, it is what the blogger is paid to do. But. let’s look at the unpaid reality of the data. Of course, the fact that this is old news and that when you examine the claims, they just don’t hold up. Nope that won’t stop the “secret leaked report” from being released tomorrow here at http://www.amap.no/ and a serial regurgitation by news media. Same old same old discredited computer models. They need a bigger, better Playstation to scare us with. Wait, stop and think about this, they are saying it’s 9mm –> 16mm PER YEAR (assume 100 years)!!! If I take into account we have 89 years until 2100, that comes to 10mm –> 18mm per year. Using the 1992-2001 numbers, they are saying that the number just suddenly jumped from 3.4mm per year to 10mm–>18mm per year; that’s a big sudden jump. One would expect to see 10 years of data to show the pattern of increase. Not to mention the fact that sea levels are unaffected by melting ice that floats.. but hey, why let simple high school science dull a good scare story? The Europeans have put all their eggs in the global warming basket – and are adamant about pushing through the Great Transformation. It’s all a sham to take over the moral leadership of the world. You can use that bogus claim and the paper it’s written on as TP. Your numbers likely come from that serial exaggerator Stefan Rahmstorf of the PIK. His graph follows the 3 – 4 mm / year increase for the next 20-30 years and then shoots up like a hockey stick after 2050. It’s just more fortune-telling from a charlatan. The 2013 IPCC report has to be more dramatic than the 2007 report, which, as Ban Ki Moon said, was “scarier than a sci-fi movie”. They need another of those “conferences” somewhere exotic to decide how best to “communicate” their latest regurgitation of this “evidence” to us poor benighted deniers. Disaster for Broome, McDonalds underwater, Airport underwater, Coles underwater, and, oh no, BOM sunk! Well, Canada just got an CAGW-skewering majority government. Let’s hope that the environment department cruises WUWT regularly. Playstation network science is down since before the Easter holidays, so they had to use a backed up report. I have not looked at these yet, but Anthony’s post now prompts me to do so. Having been doing some of my own research in this matter, I have found 3 scientific articles showing a deceleration of sea levels around the globe. One by Nils-Axel Morner, in regards to the Maldives called, ‘The Great Sea-Level Humbug’. That article, published in the Journal of Coastal Research, can be found here. That article, also published at the JCR, can be found here as well. These articles are the real story that MSM doesn’t want out. Having gone back and reviewed again this UNIPCC Report, sea-levels is tantamount to the CAGW theory. This report considers two simple indices of climate change, global mean temperature and sea level rise. The change in global mean temperature is the main factor determining the rise in sea level; it is also a useful proxy for overall climate change. As long as the IPCC stands by that document, every ‘alarmist’ will continue to deny any evidence to the contrary. Hence, we get this drivel on ‘higher that predicted’ trash from the MSM. But I’m singing to the crowd again. Most of us here know the truth. If anyone is interested in seeing my article on sea levels, with attachments from the previous 3 links, please read,‘More on Sea Levels’. I had calculated before the rate of rise since 2003, and made it available here. Please notice that it has been going down (be careful: the rate is going down; not sea-level) almost continuously since the beginning of 2006, only interrupted in the fall2009-spring2010, probably due to “El Nino”. I’ll have to update this when new satellite data gets out. Still not sure about this sea level rise business. The evidence from the Med, which has no tides and so is easier to measure, is that it has not moved a dime over the last few centuries. Not even that 5cms since 1990. It is still sitting exactly where it was, on these photos. Extra water in the ocean puts pressure on the sea floor, forcing it down and causing all land masses floating on the mantle to rise. Seems reasonable, just like pressing on a balloon, it pops out somewhere else… the area of lesser resistance ie: the land masses are forced to rise. Therefore, do not be concerned about melting land based ice causing the sea level to rise. It’s all relative. This is probably a slow self-correcting process taking an estimated hundreds to thousands of years, so a little patience is in order. So while we’re waiting for that to happen, let’s all party, drink beer, and enjoy life. No worries Mates ! Cheers ! PS: There should be huge fines for publishing the above false propaganda drivel that pollutes young minds. It’s getting monotonous. Let’s wait and listen what Obama tells us about sea level rise. If he and his experts say it is rising it is the truth. They would never lie to us. @ClimateForAll: thanks for that. I agree it’s quite clear that unless the sea level rise is *accelerating* (not just increasing at constant rate, as from the last ice age) the whole CAGW edifice collapses. If there is no acceleration in the land-based ice melt (glaciers, Greenland, land-based Antarctica) there can be no overall temperature rise, at least in any land areas with permanent ice pack. Sea level is the best temperature proxy of all. It’s showing absolutely nothing unusual going on. The problem with the Mediterranean, especially around Greece and Turkey, is that the water may be fairly static but the land isn’t. My house is only 4860 ft AMSL so somebody please let me know when I need to start running away. Floating ice that melts, perhaps? This realisation started me off on the search for better science than the scaremongers were offering. The link Anthony has provided seems a bit TOO scientific for laymen – at the scale of ice cubes, the melted ice will precisely fill the volume the ice cube was displacing. So rather than “the level of the water stays about the same” they could say “exactly the same”. The other layman’s objection to “the science” is that ALL of the gigatons of carbon in coal were (before the vegetation sequestered it) up in the atmoshpere as CO2. So why should anyone worry about putting it back there? But I see no discussion of that thought anywhere. I gather from Viscount Monkton that CO2 levels are known to have been 300000 times higher in the past than their current levels, and evidently growing conditions were then excellent. This fact seems worthy of more exposure too. Well it was obvious really when you come to think about it. – It was just thoughtless and irresponsible to market the “Climate Science Kit” purely for profit. – The kit has of course (as I very well knew it would do when I first saw it) fallen into the wrong hands. The dubiousness of this claim is even more impressive if you look at the full 130 years of sea level data http://en.wikipedia.org/wiki/File:Recent_Sea_Level_Rise.png Not only does the tidal gauge data (for a wonder) agree with the satellite data, the only apparent change in rate of increase looks to have been very modest and to have taken place at the end of the 19th century. This chart and the acknowledged 600-800 year lag between temperature and CO2 that convince me that “climate science” has more in common with phrenology than with anything an unbiased observer might describe as “settled science”. If climate science were a real science rather than a religious exercise, there would be an honest admission that we can not account for historic sea levels very well and certainly have no validated tools for predicting future sea levels. I may have to live in Europe, I may have to endure the near constant barrage of laws, rules, edicts, etc, about how I must live my life, what I should eat, drink, say, & think, eminating from Brussells, but please, when you refer to “Europe”, do remember you are referring to an overpaid, corrupt, arrogant, unelected, undemocratic, unaccountable, & unsackable, bunch of largely socialist-minded bureaucrats, & not the people within the Peoples Democratic Republic of the Eupopean Union! Thank you. Pleeease put a caption on that photo. The guy with the beard looking back at the camera has a look that’s just begging for a classic line… yes, my village used to be at the foot of that hill, or something. I saw a BBC Our World Doco over the weekend where they spent an hour telling us how they finally figured out that the Glacier in Antarctica that they were studying was actually melting from below (sea temp rise) (i.e. floating ice) and that it would cause up to 5m of sea level rise………..
It’s getting so outrageous that it’s actually just plain boring now. This stuff is so easily debunked, yet they are still airing hour long documentaries……. what is with the general public that they will just swallow this stuff without ever actually checking anything? Aren’t there laws designed to stop this sort of rubbish? Isn’t it tantamount to Yelling FIRE!! in a crowded theatre???? Probably because it is nonsense. The Carbon sequestered in fossil fuels was NOT all in the atmosphere before sequestration, the atmospheric carbon was sequestered and replaced with geologically sequestered carbon at a slow rate, about an order of magnitude slower than humans are adding carbon to the atmosphere at present. The resulting sequestred carbon is the result of millenia of conversion from the atmosphere to buried hydrocarbons and certainly does NOT represent just the atmospheric CO2 alone. CO2 levels have been higher in the past, according to computer models of the carbon cycle, when the Sun was also much cooler and the climate was ideal for reptiles but imimical to mammals. Let me guess: it’s based on that subsiding Hong Kong sea level guage, without which they “wouldn’t have a trend”? Data torture should be a capital crime in science. The steady stream of lies acually gets boring and is entirely predictable now. It has about the same impact as the noticeboard outside a local church; just a part of the background visual noise and not worthy of serious attention to the passing non-believer. It talks about a report from the SWIPA project, I think, and interestingly, if you go to the search page on http://www.amap.no/ , almost all search results on SWIPA yield a “file not found”! If your house is located at 4860 ft AMSL, that would be 58,320 in or 148,133 cm or 1,481,328 mm. Assuming a rate of 3 mm/yr you’re good to about 495,787 AD although to be prudent you should start making plans before that. At 30 cm per 100 years, grab a chair because it’s going to be a long show. Shouldn’t sea level rise be a lagging indicator of warming? It should be accelerating significantly if the late century warming was real. These folks aren’t very good at Gaian math. When you’re creating Gaian numbers, they must be VERY LARGE and very scary and very precise. 19 to 59 cm? Too small, sounds too much like you’re guessing. Should be 19,432,784.31572345098 to 59,759,210,015.31415926535 Gigameters. Not that high, 10-15X the record low rates we are running now. “When we reach this sacred urban heat island I will fill my beret with crabs, lobsters and holy shrimp. Pls not to take pictures. Thank you. Wait, when was that 4860 ft measurement taken. You may already be down to 4859 ft. 11 in. or less! That means it could be worse than you thought. I would start packing if I were you! Just to be on the safe side. It’s the ‘leaks’ causing the problem. The real scientific story needing investigation is how the Arctic Ice Cap is covering a larger area, increasing in mass and yet still melting at the same time. An amazing new property of water just waiting to be discovered by some Noble hopeful scientist. But not all the ice in the arctic is floating! First of all, the article specifically mentions ice on Greenland — that ice is definitely not floating. There are also plenty of Arctic mountain glaciers — also floating. Finally, northern Canada has a whole archipelago of islands in the arctic which are ice-covered year round and which could be losing non-floating ice. And as jaymam says @ May 3, 2011 at 3:41 am, there are other factors involved (like fresh/vs salt water).. But hey, why let simple facts ruin the fun? If ‘manmade global warming’ is real why all the secrecy? It should be out in the open and in the headlines warning everyone. The “leak” aspect, the acting like you don’t understand unless you pick up on some subliminal message, tells me that it ISN’T real. The ice that’s sitting on Greenland and Antarctica isn’t floating in the sea so as that melts it raises sea level. The Cretaceous had higher levels of CO2 (although no where near 300000 times the amount that you quote, it was about six times pre industrial levels) and during that time there was no polar ice cap. What I’ve been looking at is real estate prices in the Maldives. I’ll believe it a crisis when prices collapse. Right now most people couldn’t afford a house there. You should also factor in that most of the sea level rise is not meant to come from the melting of the ice, but the thermal expansion of the body of water due to increased temperatures. izen, that’s complete model garbage, a cooler sun was ideal for reptiles ??? What is amazing is the brazen disingenuity of the article. As you read down it, it starts with “sea levels ARE rising faster than expected” … which becomes “sea levels are FEARED to be rising faster than expected” …. and finally we get to the actual inflated truth which states that “sea level rises are NOW ESTIMATED to be between x and y BY 2100” … ie an updated bloody model of some unproven future state. The complete and utter lack of journalistic integrity is mind boggling. All the ACTUAL DATA shows exactly the bloody opposite. And yet they write this CRAP. A recent article in GRL says maybe 25% of sea level rise is contributed by aquifer depletion. IPCC’s position is overpumping of groundwater has been entirely offset by new impoundment construction. I think their tendency is to try to keep it simple. Just ice melting and water warming. I think aquifer depletion has been a major contributor in recent years. The Russians even dried up Lake Aral, once the 4th largest lake in the world, along with the water table that was part of it. At least they are keeping it “green” and recycling…. Dr. Jim Hansen, NASA GISS, 2011. Twenty percent of the Netherlands are below sea level and protected by dykes. They must have measurements of sea level rise going back quite a ways. Does anyone know what their measurements indicate? They leaked a report predicting more than expected sea level rise by 2100. How brave and predictable. By 2100 no one will remember this leaked report nor will they see it as true. “…due to rapidly melting Artic ice sheets…” — wow, they can’t even spell Arctic. What loon wrote the news piece? Sea levels aren’t rising due to Arctic ice — it freezes over every winter. Hmmm. Looks like that isn’t working out too well either . . . I wonder what effect the record North American snow pack has had on sea level? I do not know that the GEOCARB III model of the carbon cycle is ‘garbage’, certainly the Rothman figures derived from strontium isotope proxies indicate much lower CO2 levels in the past than are derived from the GEOCARB model. Around double present levels in the crfetatious for instance. However the Triassic/Jurrasic era had CO2 at 3-4 times present levels and a lower solar output. The total result was a hotter globe with little or no polar ice and large dry deserts on most internal continental regions. Okay, I admit I was being a little provocative in labelling such conditions as ideal for reptiles and not for mammals. The real situation was reptiles evolved to optimize for the prevailing climate excluding mammals from most ecological niches. The species adapted to the conditions, and it wasn’t until the Yucatan meteorite eliminated most of the large reptiles that mammals got the chance to evolve into all the newly vacant ecological roles. The lower CO2 and temperature did favour mammals though because of their superior temperature regulation, especially in cold ambient conditions. It’s working out fine – sediment cores, tidal gauges, satellite measurements. What they find is sea level rise has been steadily accelerating over the past century. “The “leak” aspect,…, tells me that it ISN’T real. Great point. Why is ALL climate data not in the public domain if global warming is real? Why did anyone have to leak anything ala ClimateGate? There should have been nothing to leak. This really is the most important message about global warming. If the science is settled and global warming is real, why is there any secrecy? Why not simply publish the raw data and methods on the internet? Why does it take a FOI request to get this information? Surely it is much cheaper to simply post the information to a public server that for people to answer FOI requests. Internet storage has become so cheap that many sites simply give space away for free. You can store data for years on the internet for what it costs to answer a single FOI request. The fact that climate scientists continue to hide data at great expense behind FOI requests, rather than take the less expensive approach and simply post it to the public domain is evidence that they are purposely and knowingly hiding something. This is what ClimateGate exposed. Not that the science of global warming was wrong. Rather that there was something to hide. The average person on the street may not understand thermodynamics and TSI. They do however understand secrecy. A continual steady rise in sea levewl over the length of available records. 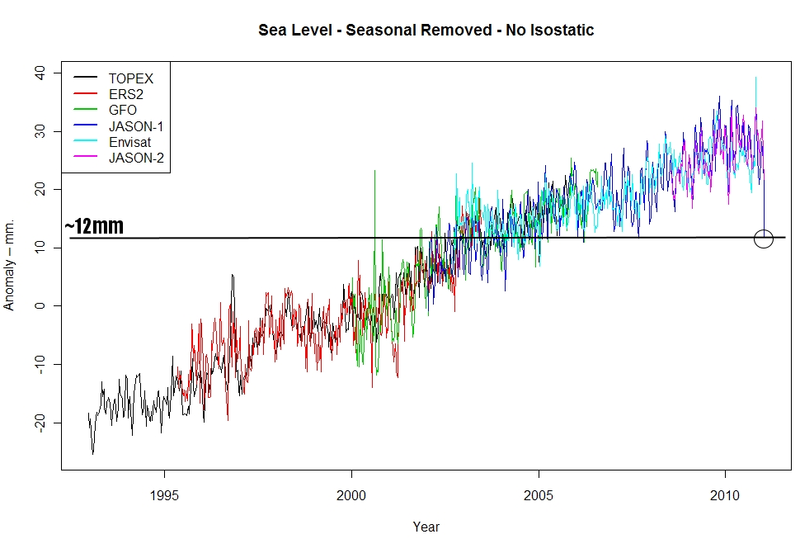 However this is not as definitive a conformation of global sea level rise as might be desired. The Netherlands are subject to isostatic rebound from the loss of the North Eurasian ice-cap at the end of the last glacial period so it is sinking relative to sea level. Meanwhile the measurements are often taken at harbours and bridges newly built on reclaimed/drained land which also subsides as water is lost and sediment build-up weighs down the surface. Eclipse records indicate very little possible variation in sea level for the last 6000 years certainly nothing of the magnitude of millimeters a year seen over the last century. Archeological evidence supports that. The recent rise is probably unprecedented since the end of the last glacial period and the A1 melt pulse during the Holocene optimum. Wait! You still have to add all the feedbacks! &izen: excuse me, but what were the “eclipse records” you refer to? Solar? Lunar? What was recorded and how does this serve to determine historic sea levels (other than them all being during spring high tides of course)? Yeah, around 2-3mm per year. Like most places. But being an anonymous troll, of course you didn’t mention that. It now appears that the only thing falling faster than sea level is the support for carbon taxes. In yesterday’s Canadian elections Cap and trade supporter David Ignatieff leader of the labor party even lost his own seat. George Soros must be beginning to wonder how efffective Joe Rom is in rallying the AGW faithful. I’m confused now – I thought higher CO2 meant WARMER climates, and that the sun was not a major contributor to the climate compared to CO2. “It’s working out fine – sediment cores, tidal gauges, satellite measurements. What they find is sea level rise has been steadily accelerating over the past century. Actually, Figure 3a says precisely the opposite and Figure 3b makes it even more clear. The sea level rise in the past 20,000 years (200 centuries, not the past century) is attributable to the end of the last ice age. Figure 3b makes quite clear that little if any rise and no acceleration has occurred in the last three centuries. The same trends are true of satellite measurements in the last 30+ years. Oh dear, I guess I am replying to a post that you deleted. The San Francisco Chronicle has the story on the front page of their SF Gate site as well. The weasel out, and you are correct! I think they call this the lie of omission. In other words, they do not say that the original rate is 0, so yes, 3 times 0 is technically correct! @Entomologist: it’s the *acceleration* (the 2nd order MSL differential) that’s zero. The MSL *rise* is a constant 3mm (approx) per annum – about 1ft per century, ongoing, reflecting the continuing steady melt as from the last ice age. Actually nothing along those lines up to now also nothing in the conference program schedule on their website, this must REALLY be recycled old news launched just in time by somebody to stir confusion. Funny, they have an “Icebreaker event” on the 3rd before the conference starts….. I measured a 400mm rise in sea level the other day. I was going to report it but then I realised my boat was sinking. Oh dear, not sea level rise again! Wherever it’s happening (and can anyone show anywhere it IS happening), it ain’t happening here! Info about a TIDAL mill here in Hampshire UK which has been using the tide to grind grain for 900 years IN THE SAME SPOT!! NO relative level change AT ALL! This:http://www.washingtontimes.com/world probably identifies the source of the report referred to above. Rather than a leak, it appears to be a press release previous to an AMAP conference beginning 4 May in Denmark. Wonder where Walt Meier can be found? Check the attendees list here:http://www.amap.no/. I find 8 attendees with .gov or .org in their email addresses and a total of 18 attendees from “USA”, only one of which has a .com address. Interesting times. OT I saw the name Mummery ( an Australian Gov’t official I believe) somewhere here. What an intriguing name for a CAGW advocate. >>Turkey, is that the water may be fairly static but the land isn’t. So they say. But if you go just 30 miles down the road from that picture, you come to Phaselis, where the Greek port is in just about exactly the same position, relative to sea level, as when the Greeks built it. @TimC: you are absolutely correct, I should have written “rate of sea rise”. Mea maxima culpa! I have my doubts in regards to satellite altimetry. When ever someone wants to show a rise in sea levels, they pull out there handy dandy satellite graphs. It has already been determined that satellite imagery data is consistently higher than tide gauges. And I imagine that with the latest JASON-1 and JASON-2 data, that shows a deceleration in global sea level, the warmistas have to attack now to gain leverage. Even if its an illusion. Good point about seawater vs. freshwater. Just curious: if we are talking about Arctic sea ice, where did it primarily come from in the first place: frozen seawater or precipitation? If the former, when the sea ice becomes more pure, does that make the underlying seawater more saline, and if so, what is the consequence of that? In other words, if you start with seawater, freeze it, then melt it, what kind of sea level rise will you observe? DCC, I think you’re replying to SteveE’s comment, not mine. I don’t think sea level rise is accelerating. SteveE made that assertion, and I believe he is mistaken, based, for example on Willis’ and Roman M’s plots in the head post above. Perhaps you should learn how a graph works. The line notes the global mean sea change over the last 140 year. As you can see the rate that it is going up is increasing, this is called acceleration. The graph in 3b is the rate per year of that change. If you’re able to read off the graph that in 1880 it was about 1mm/year and now it is higher than 3 mm/year. Home at the farm we just call it spring flood. Apparently it happens every year and is no biggie. Like I said before, forget these guys. The true rise will be 24.6 cm. So it’s rising 3x faster and it’s declining at the same time. Makes perfect climatology sense to me. Feared to be rising, worse than we thought/previously imagined, catastrophic, imminent doom (rhymes with eminent domain). It’s like watching kids being transfixed by video games. Do you mean Copromania? Macromania might also be in play here: delusion that objects are larger than natural size. Maybe they are taking the fact that a deceleration is technically an acceleration and running with it in the hopes that no one notices. I suspect the Conservative Majority just elected here, can thank team global warming to a small extent. No carbon tax for Canada, and vanishing funding for AWG/CC/whatever research. And the artists were protesting funding cuts to the arts, while supporting the eco-nuts I guess they do like competition after all. So in “couple of weeks” we’ll see if the wait for the new prettier web page was worth it. A “couple of weeks” from April 15th would be about 3 days ago. I do not see the new and improved communication presentation or sea level. Do you think that they meant a traditional 7 day weeks or some kind of new and improved variable length climate change week? A variable length week would yield a variable length year, decade and century; this would vastly improve the predictive capacity of the computer models. 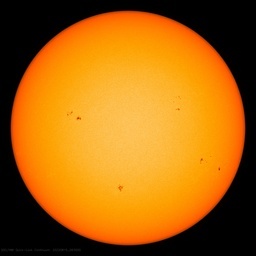 Do you suppose that this is what they have not been communicating very well, the variable length climate change week? Nice attempt at CYA, Izen. Besides the isostatic rebound to the north and the corresponding subsidence of the North Sea region around Holland, please cite your evidence of the “eclipse records” and archeological evidence “supporting that”. This “unprecedented rise” since the A1 melt pulse after the last glaciation….again….cite your evidence. Correction when I say “supporting that” I mean Izen’s allegations per his/her quote…not the fact that isostatic rebound and the related subsidence is real, which it is. Have a look at this tapestry of Tower of London circa 1150AD, and this photo from 2005. Notice any sea level rise? They’re just applying Mannian math, where the sign is insignificant (remember upside-down Tijander?). Have a look at the graph I linked to and tell me it’s not accelerating over the last 100 years. Are you aware how tides work? They go up and down twice a day normally and in some places that can be as much as 14m such as in the Bristol channel between England and Wales. The tidal range in Southapmton is ~3m so a change of a few centimeters since that thing was built isn’t going to stop it working just yet. Trying to suggest that that is proof that global sea levels are rising though is quite idiotic though, much like saying it was cold here today therefore global warming can’t be happening. You’re just making yourself look silly now. I’ll give you a clue… the Tower of London is on a river with a tidal range. It goes up and down. The Arctic is warming. Surface air temperatures in the Arctic since 2005 have been higher than for any five-year period since measurements began around 1880. The increase in annual average temperature since 1980 has been twice as high over the Arctic as it has been over the rest of the world. Evidence from lake sediments, tree rings and ice cores indicates that Arctic summer temperatures have been higher in the past few decades than at any time in the past 2000 years. First: Since when did 5-year periods become long enough to measure climate change? I guess they had to concentrate on the last 5 years to get a period that was really warmer than any equally long period from the 30s or 40s. Second: What “evidence from lake sediments, tree rings and ice cores” (there are no references in the executive summary)? It would be interesting if they are going to present new research, but my guess is that the reference for this is Kaufman et al 2009, with all its problems (including the use of Yamal tree rings) that Steve McIntyre has pointed out. i know that this is urinating in the holy water but has anyone given thought to the possibility that at least some of the tidal gauges are sinking rather than the sea rising. The tidal range in Southampton is ~3m so a change of a few centimeters since that thing was built isn’t going to stop it working just yet. Sorry, I’m not sure what’s going on here! I posted this to show there is no appreciable relative sea level rise at this location. Over almost a thousand years it should have gone up about three metres and the mill (or at least the site on which it is built) should be inundated, even at low tide. Conclusion – no appreciable relative level rise. Of course, the land may well be rising to compensate, but given the geology I don’t think so. All around my local area is ample evidence that the sea has NOT risen in thousands of years. Can anyone show incontravertible evidence that it is rising (in an absolute sense, not just because the land is sinking) anywhere? That seems to agree that sea level has remained fairly static until resently when it can now be measured at increasing at 3mm per year. I’m glad that this mill can be used to demonstrate that sea level must be increasing at an accelerating rate otherwise it would have been innudated by now. TonyK, have a look at figure 3a in the below paper on sea level rise and you’ll see that during the 19th centuary sea level was fairly static at less than 1 mm per year. This has steadily been increasing since then and at precent is ~3mm per year. This increase is due to global warming that is melting the ice caps and causing thermal expansion of the water and is caused by mans use of fossil fuels since the industrial revolution. SteveE, you conveniently ignore the fact that sea levels dropped during the little ice age, so there would have been a rebound regardless of human activites. … Eclipse records indicate very little possible variation in sea level for the last 6000 years certainly nothing of the magnitude of millimeters a year seen over the last century. That is a fascinating way to look at it, do you have a citation? Seems like it would be a useful metric. It’s not accelerating over the last 100 years. The graph has improperly spliced satellite and tide gauge records, and reported the higher satellite records as an “acceleration”. You really have to be careful with AGW supporters, they’ll move the pea under the thimble when you’re not looking. Here’s one way you can tell if sea level claims are bogus — look for the name “John Hunter” among the authors. He’s a wild-eyed AGW supporter, his presence guarantees headlines about ‘acceleration” and “dangerous” and the like. In addition, note that (if the Church/White paper is correct) the change in the rate of seal level rise occurred about 1930, and since then the rise has been nearly linear … perhaps you’d care to explain that oddity, since Church/White didn’t discuss that. Indeed, a close look at their figure 3a shows a straight line from about 1870 to 1910, a drop to 1930, and a straight line rise since then. Now, how does that particular change fit into the AGW scenario? The problem is that climate scientists have forgotten how to say “we don’t know”. We don’t know why the sea level fell from 1910 to 1930. We don’t know why it started to rise again. It’s really no use just regurgitating the earlier papers. If Anthony and Willis are right the up-to-date data disproves them so a new theory must found to account for the data. But it’s relatively early days and at a rise of only ~12 inches/century we needn’t rush to judgement. Comment #12 of 13 (at this time). At 19 hours ago, this is pretty much off the news cycle for Digg. Interesting that only 9 unique people made only 13 comments, and the last was “yawn”. People are waking up. Grats to WUWT and thanks for your contribution. Last year, AGW stories would get hundreds on comments on Digg and Fark, now: not so much. I say their climate model . . . is drone computers that run on a loop . . . .
@Willis: re your last to izen (who I don’t think has yet responded), the “eclipse records” are referred to in the video link at the URL izen gave above (“Try this –“). The metric seems to be that comparing medieval eclipse records against modern-day calculation produces historic values for ΔT from which accumulated delays in orbital rotation can be obtained, hence mean sea levels by conservation of orbital momentum. BTW, Meeus’ Astronomical Algorithms (2nd Ed) already gives apparently accurate values for ΔT back to 1620, in case you are interested. @SteveE – Thanks. I was aware of that. And what about the MWP then? Perhaps not to Mauder or Dalton minimum levels, but certainly a low which would explain the “drop” you mention. It also isn’t a straight line since then as the graph in figure 3b clearly shows the 20-year trend. It increased post ~1930 to 2mm/year then fell again to ~1.5mm/yr in the mid 20th centuary and then started rising again in the 1980’s and is continuing to a high of over 3mm/yr. I think that covers all your points. I can’t really comment on your remark about John Hunter though, however if it’s any consolation I have similar thoughts when I see an article written by yourself. Well obviously we’ve got alarmists, look at Al Gore, aka the worst thing to happen to environmentalism this century. Regardless, it’s probably best that we start cutting back on CO2 emissions and other greenhouse gasses. The jet stream and North Atlantic currents are already starting to get screwed up. I’m not worried about being NYC being underwater, I’m worried about ice storms all winter in Pennsylvania and tornadoes and flooding killing hundreds in the midwest every year.